Diastasis recti, also known as abdominal separation, is common in pregnant women—nearly two-thirds experience it. This does not, however, mean that diastasis recti in men is impossible. Diastasis or divarication of recti describes the separation of the rectus abdominis muscles when there is pressure pushing them apart. This often results from the linea alba, the connective tissue holding the two sides together, stretching or thinning. In men, it can be caused by excessive muscle or fat, an expanded stomach, or a hernia, forcing the abdominals to separate. Diastasis recti in men does not hold life-threatening symptoms, but it can make your life more difficult than it needs to be. We will focus on what causes diastasis recti in men and possible treatments for diastasis recti symptoms in men. What Does Diastasis Recti (Separation of Abdominal Muscles) in Men Mean? The term “diastasis” comes from the Greek word meaning “to separate.” Diastasis recti refers to the separation of the muscles that run vertically on either side of the navel from the breastbone to the pubic bone. This stretching of the muscles can reach a gap of at least one inch or more. Diastasis recti develops in men gradually over time and is noted by a protruding bulge in the mid-abdomen. It can be fully seen when doing a sit-up exercise. It is often misdiagnosed as weight gain due to the lacking tone, or tension, of the muscles and the look of a pooch. Diastasis recti occurs when too much pressure is put on the abdominal muscles. The strain causes them to separate through the middle, allowing what’s normally protected behind the abdominal wall to push through. It can result in a bulge, or “bubble gut,” in men. Diastasis recti is found in infants due to muscle development problems, and in pregnant women due to the abdomen stretching from a growing uterus. Diastasis recti in men is seen due to several factors. It is important to perform any type of workout routine or strength training exercise with the proper techniques. Diastasis recti can result from poorly managed sit-ups or weightlifting exercises. In men, diastasis recti can occur from gaining excess weight. The weight can come either from muscle—which is why many heavyweight powerlifters and bodybuilders have “guts”—or from excess fat deposits. Extra weight on a woman usually appears on the hips, whereas men tend to add weight in the abdomen first. When men gain weight quickly, the extra pounds can apply increased pressure to the stomach muscle, causing diastasis recti in obese males, or overweight males, to occur. Your past medical conditions, as well as family history and traits, can also dictate diastasis recti in men. The risk is higher in those with family members with the condition. Some causes of abdominal splitting can arise from other conditions. Sometimes swelling can occur in the abdomen as a result of fluid filling into the abdominal cavity. This can happen in people with cirrhosis of the liver or cancer in the abdominal walls. Age may also play a role as diastasis recti in older adults is common, especially if they’ve been overweight for a long time. Bending over to pick up heavy packages/items: Instead, squat down and lift through the legs. Having an abdominal aortic aneurysm (AAA): Studies have shown that men with AAA are more likely to have diastasis recti. Diastasis recti was present in two-thirds of men with the condition, and present four times as often when compared to men with other varying vascular conditions. AAA occurs when the large vessel carrying blood to the abdomen becomes swollen. It can be life-threatening if left untreated. Diastasis recti can be diagnosed rather easily during a physical exam. The physician will ask you to lie down on your back and perform a crunch, or half sit-up. If you have diastasis recti, a vertical bulge will appear between your abdominal muscles when you perform the movement. The doctor will then measure the gap using calipers, a CT scan, or an ultrasound, and the proper treatment can be recommended. If you think you may have it but don’t want to book a doctor’s appointment quite yet, here is a test you can do at home. Place your fingers just above your belly button and lift your head and shoulders off the ground. Feel the chords on each side of the abdominals (where the sides are closest to touching). If there is more than two fingers’ distance between them, you may have it. Thankfully, at this point, you can do some exercises to reduce the gap. If you see a bulge in the middle of your stomach muscles when you get up from lying down or sitting, you likely have diastasis recti. It is crucial to recognize the symptoms of diastasis recti in men as the thinning of the muscle tissue can promote a hernia from protruding nearby organs. Diastasis recti treatment for men includes several specialized exercises that target the muscles. We have outlined five diastasis recti exercises for men below. Lying on the floor, bend both your legs and plant your feet flat on the floor. Place your hands on your lower stomach with your fingers pointing towards your legs. Breathing in and out at a steady pace, slowly lift your head and shoulders off the floor and press down on the abdomen. Repeat 10 times. In the same floor position as Exercise #1 with your legs bent and feet flat, tighten your stomach muscles as you lift your hips off the floor. Repeat 10 times. Remaining in the same position with your legs bent and feet flat on the floor, inhale deeply, and upon exhaling, slowly straighten one leg as you slide it along the floor. Bring the leg slowly back to the starting position as you inhale. Repeat with your other leg, alternating 10 times. In a sitting position on the floor, place your hands on your abdomen and take small breaths as you slowly contract your abdominal muscles towards the spine. Hold for 30 seconds and keep your breathing controlled. Repeat 10 times throughout the day. Lying on the floor with your legs bent and your feet flat on the floor, slowly lift your head with your chin pointing towards your chest as you slowly contract your abdominal muscles towards the floor. Hold for two seconds. Repeat 10 times. Because diastasis recti in men usually occurs in athletes like bodybuilders, powerlifters, and those who regularly twist their core (golf, tennis, baseball, etc.) or are exercising their core all the time, the best thing to do may be to visit a doctor or physiotherapist before trying anything at home. Learning correct technique, and even finding out if exercises will help you, is very important. It should also be noted that the context of diastasis recti in men is quite different than that of women. You may notice that the variety of exercises and information available on the Web are directed towards women. The difference is that women likely experience abdominal separation during pregnancy. Once the baby has been delivered, their stomachs no longer have the pressure or resistance of a baby, and the environment is conducive to exercise treatment. In men, who develop diastasis recti from too much fat, too much muscle, or a medical condition, the pressure isn’t expelled the same way it is in women. Therefore, the treatment will likely differ to some degree. Movements involving lying on a medicine ball (unless instructed by your physiotherapist or fitness professional). Weighted squats/deadlifts/lunges (unless proper technique is performed and it’s done with the approval or under the instruction of your therapist). These movements also translate into everyday life, so avoid picking up or carrying heavy objects. It should be noted that performing these exercises will help strengthen core muscles. Technique is essential, and going light, using body weight, can be helpful to repair separated abdominals. To assess your particular situation, you must talk to a doctor or therapist first. Pilates or mat exercises that utilize upper body flexion and double leg extension (until instructed by healthcare or fitness professional). If you’re using exercise to repair diastasis recti, patience is a virtue. It takes time, effort, and consistency. A specific training program called the “Tupler Technique” has been designed with the specific goal of treating diastasis recti. It claims to be the “only research-based exercise program proven to effectively treat diastasis recti” and seems to be targeted at pregnant women; however, it offers programs for men, too. While we cannot confirm that this method is useful, it implements a four-step program over the course of 18 weeks aimed at strengthening and rebuilding the connective tissue in the abdominals. The Tupler Technique emphasizes a mind-muscle connection and body awareness while offering a targeted approach to healing the area. It involves wearing a splint, avoiding activity, and then learning how to make connections to the abdominal muscles, particularly the transverse abdominals. The technique is administered by certified professionals, and you can get more information by visiting its web site. Some severe cases of diastasis recti in men may require a surgical procedure known as abdominoplasty. 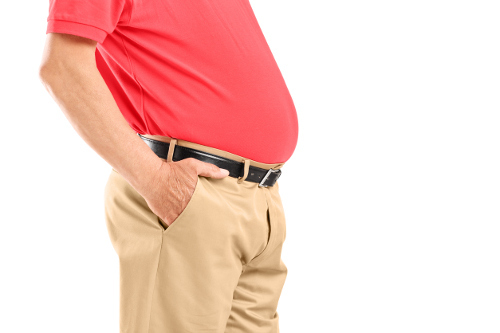 Most instances of diastasis recti in men may not be a danger to one’s health but should be treated to avoid further damage to the abdominal muscles and possible hernia conditions. This separation of the rectus abdominis muscle can occur over time as the sufferer incorrectly performs strength training exercises, gains weight rapidly, or may even have a family history of the condition. Appropriate diastasis recti in men treatment directly focuses on strengthening the affected muscles. “Abdominal Separation (Diastasis Recti),” WebMD; https://www.webmd.com/baby/guide/abdominal-separation-diastasis-recti#1, last accessed April 6, 2018. Hickey, F., et al., “A systematic review on the outcomes of correction of diastasis of the recti,” Hernia, Dec. 2011; 15(6):607-14; https://www.ncbi.nlm.nih.gov/pubmed/21688021, last accessed April 6, 2018. Moesbergen, T., et al., “Diastasis recti and abdominal aortic aneurysm,” Vascular, Nov. to Dec. 2009; 17(6):325-9; https://www.ncbi.nlm.nih.gov/pubmed/19909679, last accessed April 6, 2018.